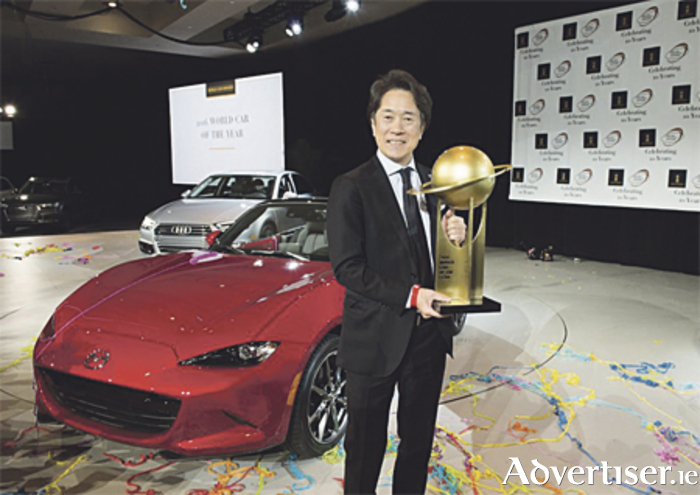 The all-new Mazda MX-5 has won the 2016 World Car of the Year and World Car Design of the Year titles. It is the first car to win both titles in the history of the awards. The MX-5 has now won more than 30 awards, including 2015-2016 Car of the Year Japan and 2016 UK Car of the Year (UKCOTY ). The World Car Awards were announced at the New York Auto Show last week. The most powerful Audi road car ever built, the R8 Coupe won the World Performance Car 2016 award. The World Luxury Car 2016 title was won by the BMW 7 Series. Finally, the 2016 World Green Car was won by the Toyota Mirai. The hydrogen car beat off two of the top hybrid models to take the award. The vehicles were selected and voted on by an international jury panel comprising 73 top-level automotive journalists from 23 countries around the world. Each juror was appointed by the World Car Steering Committee on the basis of expertise, experience, credibility, and influence. Each juror typically drives and evaluates new vehicles on a regular basis as part of their professional work. Eddie Cunningham, the accomplished motoring editor of the Irish Independent, was the Irish juror for the World Car Awards. He succeeded Padraic Deane two years ago, after the latter had completed a six-year term as the Irish juror.